“Green energy” or renewable energy is collected from renewable resources and replenished by the simple existence of the planet. Some examples are energy from the sun, wind, tidal wave and geothermal heat. The process of energy from renewable resources is the conversion of these different forms of energy into electricity. In the case of geothermal energy, it could be electricity or heat transfer for heating and cooling of a structure. One common theme in the development of seals for green or renewable energy is that the seals have extremely low drag. Because we typically harness small amounts of energy from these various sources, a high drag style seal can completely negate the gain of energy we are trying to harness. In the case of the sun, solar-powered photovoltaic (PV) panels convert the sun’s rays into electricity by exciting electrons in silicon cells using the photons of light from the sun. While this process doesn’t use seals per se, collecting the highest percentage of solar power is done by aiming the panels at the sun. Tracking software allows the panels to reposition by using motors. These motors often contain environmental seals to keep the motor running smoothly throughout its life. These seals need to have extremely low friction to allow smooth operation of the panel. These panels may have gear boxes with gear oil. A low-friction rotary lip seal will seal fluids in, and keep the environment out. For direct drive high torque, low speed motors, Teflon lip seals again will retain fluids and keep the environment out of the motor and gear housings. Wind mills have long been a source of energy— either through direct drive, use in pumping water or grinding wheat or, in more modern times the generation of electricity with small compact generators. In either case, seals or rope packing have been used to harness energy. For pumping water, the pumps traditionally use a stuffing box that generally used a type of rope packing which allowed the reciprocating action of the pump to draw water from the ground. This water is often used to irrigate fields or water cattle in remote locations. Today, windmill farms spot the countryside producing a renewable source of electric power. These giant-bladed electric generators are highly engineered with gear boxes, pitch control blades and swivel joints to keep the wind mills pointed into the wind. Seals play an important part in keeping wind generators functional — starting with the gear box, seals ensure even a small amount of wind capable of turning the blades and producing power. Valving within the system changes the pitch of the blades to take advantage of the wind — no matter how strong or how slight — keeping the wind generator safe from over speed. The blades are sealed to maintain fluid in the hub of the blade to allow the blades to pitch over to maintain a constant rate. 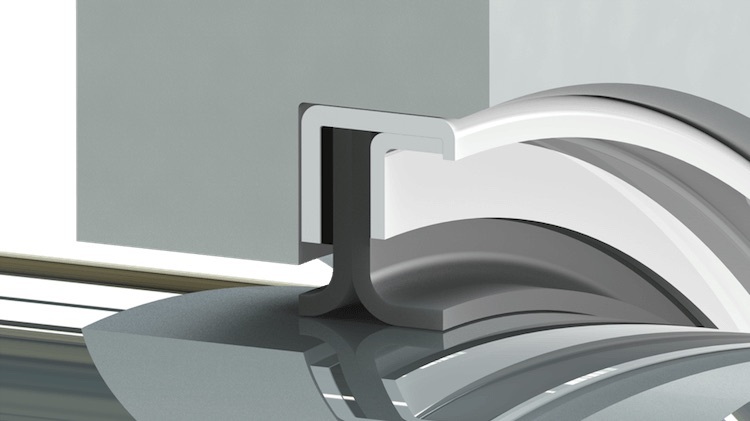 Again, low-friction seals are required to maintain fluids in place, and allow smooth operation of the blades. Non-metallic bearings are used for components to be operated smoothly without binding. Seals in wind generators see extreme temperatures, and operate in hostile environments perched hundreds of feet in the air. Teflon lip seals, rubber energized seals and spring energized seals are frequently used in combination to keep the wind generators turning at a rate that allows long life, with little need for service due. Another form of power generation is the use of waves from the ocean. The moon’s rotational path causes the oceans to move creating waves. This wave action can be harnessed in the form of energy by collecting the motion of the waves moving in and out, thereby generating electric power through this motion. These paddle-like generators rotate rhythmically with the wave thereby turning generators internally and producing electric power. Seals could be found in these generators to keep the ocean water out and gearbox oil in. Seals need to be impervious to seawater and be low enough friction to allow the generator to turn freely. These are typically radial lip seals with Teflon lips. Seal designs utilize multiple lips to ensure that the water stays out and gearbox oil stays in. Seals will continue to play an important role in the generation of renewable energy with the use of low-friction materials and seal cross sections to fit the need of the application. Most applications for renewable energy last for up to 30 years in service. While rubber seals offer great seal-ability, they don’t have the longevity in service like a polymer style seal does. A 30-year life span is not uncommon in this industry.